A mysterious, giant creature which reportedly 'has eyes as big as dinner plates' has washed up a popular beach. This mysterious creature left locals stumped after washing up on the shoreline, with stunned fishermen reporting it was a 30ft giant squid. The bizarre "globster" was spotted near St James Bay in the US state of Alaska by a crew who believed it was a giant squid with "eyes the size of dinner plates". 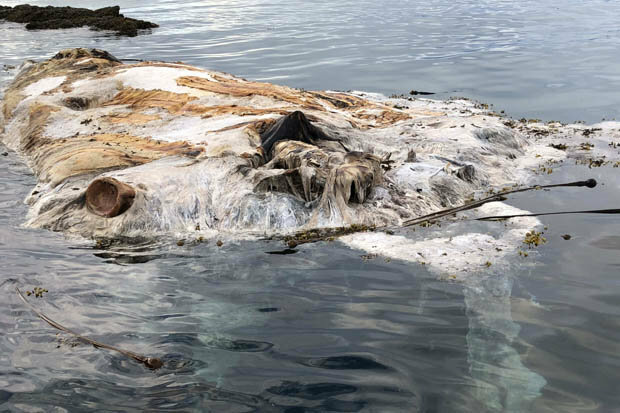 But a biologist from the National Oceanic and Atmospheric Administration has now inspected the corpse and revealed it to be a decaying humpback whale. 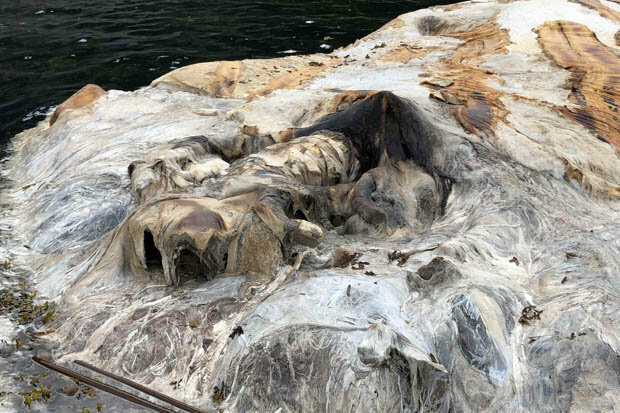 It’s one of several globsters – a term used since the 1960s to describe washed-up creatures with “no visible eyes, no defined head, and no apparent bone structure” – to have caused a stir recently. Biologist Johanna Vollenweider, who inspected the carcass, said it had lost its head and its tail, and was easy to mistake it for something else. “Fishermen mistook the animal as a giant squid likely because they could not get very close to it as it was hung up on a rocky reef very near the shore,” she said. “The animal was highly visible to our gillnet fleet, which was actively fishing in the area. From a distance, the animal could look like a squid. “The body was very soft because it was so rotten and there were long, orange stripes along the body which are the pleats of the expandable throat of the humpback whale. “Perhaps these looked like tentacles from afar. A similar globster left locals in the Philippines spooked in May, with some taking it as an omen of impending disaster. Johanna said decomposing whales tended to leave people bewildered because of how they deteriorate. “The blubber gets real soft and gooey when it rots,” she said. “Animals also eat the carcasses so body parts are mutilated. 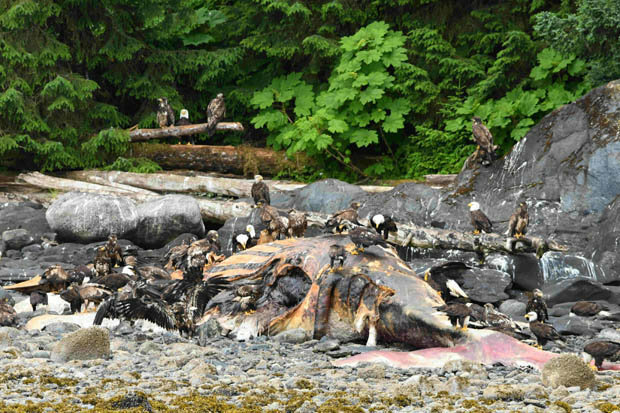 “This whale washed up on the beach for a period, and was eaten by eagles and likely brown bears before it floated off the rocks. “Somehow, during that time, part of the head with the baleen as well as the tail disappeared. It’s believed that the whale was killed by a ship strike, with evidence of blunt force trauma to the body.